In practice works have been ongoing since May, but formally the groundbreaking ceremony took place yesterday. Austria follow their league rivals Rapid in upgrading their stadium. On Monday a special ceremony took place in southern Vienna. Austria players and officials mounted the cornerstone for new stands at Generali-Arena. 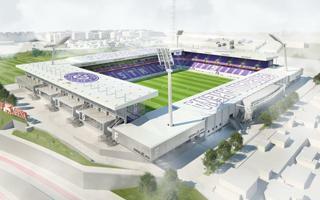 By 2018 the club will have invested €42 million ($47m) in comprehensive upgrades to their stadium and training complex. Smiles and photo-ops may have happened yesterday, but in fact the reconstruction process began back in May with preparatory works. By July demolition of the old west and north stands proceeded. As a result the current state clearly sees a lot of excavation and early foundation works done. During the current Bundesliga season Austria are playing their home games at Ernst-Happel-Stadion in central Vienna, just like Rapid did during the construction of Allianz Stadion. For Austria the relocation hasn’t been going well so far, with attendances averaging as low as 7,189 people per game after 5 fixtures. The more eager many fans should be to the moment of returning home. The entire reconstruction project won’t end until mid-2018. It will result with Generali-Arena’s capacity reaching 17,500, including 28 skyboxes and extensive hospitality infrastructure.